"Sorry Sam. Sometimes it is about the money." 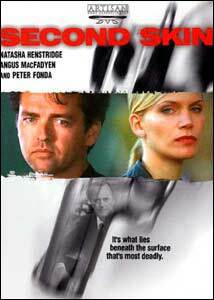 Second Skin is a fairly diverting thriller starring Natasha Henstridge as Crystal Ball and Angus MacFadyen as Sam Cain, a pair of star-crossed lovers whose lives are complicated by amnesia, changed identities and hit men. Crystal visits a small bookstore owned by Cain, posing as someone who is looking for a job and a fresh start. Leaving the store, she is struck by a car and wakes up in the hospital with amnesia. He helps her to rediscover her identity and unusual events begin to crop up that reveal deeper complications in the story. Peter Fonda plays the role of Merv Gutman, a gangster who has hired Crystal and her partner Tommy Gunn (Liam Waite) to kill Cain to avenge a betrayal and theft. The film is stylishly directed and the glitz of the attractive actors and settings (South Africa standing in for what seems to be California) almost cover up for the "by the numbers" film noir plot. There is a certain balance between the non-acting of Henstridge and Fonda and the over-acting of MacFayden and Waite. Director Darrell Roodt, who also directed 1995's Cry The Beloved Country, does the best he can with the fairly thin material in the script. There seems to be a slight disconnect with realism that lends the film a Twilight Zone quality and keeps it from being a more potent story. Perhaps international moviegoers or viewers who are less knowledgeable about "gangster" details would not notice this. Hentstridge zoomed to fame in 1995's Species as an alien visitor and that role lent itself more to her less-than-expressive acting, although she is a beautiful woman. She had a particularly busy year in 2000, appearing in 6 films including the popular comedies Bounce and The Whole Nine Yards. MacFadyen made his film debut a big one as Robert the Bruce in 1995's Braveheart and performs creditably here. He has also appeared in other acclaimed films such as The Cradle Will Rock and Titus. As head of the "Tanners' Union", Fonda has some interesting—and amusing—moments as the film's heavy. His career spans 40 years and includes the legendary Easy Rider, as well as countless B-movies. He won the Academy Award® in 1997 for his role in Ulee's Gold. The actors keep this fairly run-of-the-mill story above water. Many moments of the film are stylized homages to the classic elements of film noir in general and Alfred Hitchcock in particular. The story is fast moving and although some parts are not completely realized, it all leads to an interesting and satisfying conclusion. Image Transfer Review: This is a very nice image transfer from Artisan. The print is crisp and I noticed almost no defects. The colors seem particularly sharp and lend a gloss to the whole production. Fleshtones are well-rendered. Obviously a technically well-conceived source, given a quality effort in its transfer to DVD. Audio Transfer Review: The audio transfer is good in both the English and French Dolby Digital 5.1 soundtracks. The spacing of the dialogue and the sound effects all benefit nicely from the understated ambient surround. In Hitchcockian style, there are moments of tension that rely on very little dialogue and I found those to be a particular mark of distinction. Extras Review: Typically for a film of this type, the extras are restricted to a decent rendering of the original trailer and cast and crew biographies and filmographies. Second Skin, although somewhat lightweight, is recommended for fans of identity thrillers as a decent entry into that genre and for fans of the inimitable Miss Hentsridge. Worth a rental.